Perfectly cluttered in every way. We’re just happy to have customers that appreciate our “Perfectly cluttered bookshelves,” and keep returning to our store even when new technologies present entirely different reading options than we can offer. 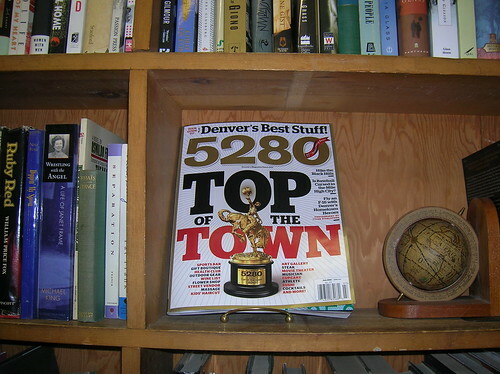 So thanks to 5280 Magazine, its readers and to our customers who continue to value books and our bookstore throughout our 30 years in business. This entry was posted in Uncategorized and tagged 30 years, 5280, awards, best used book store, Capitol Hill Books, Denver, Reading. Bookmark the permalink. Fantastic! Still one of the gems of Denver, and though I work out of town 10 months a year, a visit is mandatory every time I’m back. I can still remember meeting one of the original owners (I think) or managers (DJ? AJ? Great lady with long hair) in the summer of ’84 when I began going there. Always good for a long visit when I’m home. Glad 5280’s readers understand what a treasure the place is! Congrats! Your store is a great place.